A quality automatic garage door opener makes coming and going from your home safe, secure, and simplistic. 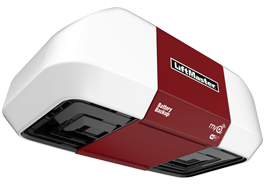 We install LiftMaster openers that are powered by quiet and powerful DC motors that are equipped with security enhanced features. Regardless of your garage door brand, we have an automatic garage door opener solution to meet your specific needs. We offer automatic openers designed for multiple door types including: rolling doors, one piece tilt style doors, and sectional/panel doors. Whatever the door, we have what you need. Model 8355: LiftMaster’s Premium Series Garage Door Opener provides durable and energy efficient performance that will last you through the seasons. The Motor Vibration Isolation System (MVIS:registered:) provides quiet/smooth operation while being fully equipped with Security+ 2.0:registered: and MyQ:registered: Technology. Model 8550: Part of LiftMasters Elite Series, this model ensures that you have access to your garage at all times, even during unforeseen circumstances such as a power outage. This revolutionary DC Belt Drive offers quiet operation and comes fully equipped with Security+ 2.0:registered:, MyQ:registered: Technology and a Timer-to-Close feature. Model 8500: Also part of LiftMaster’s Elite Series, this wall mounted opener offers a sleek, space-saving design that mounts onto the wall beside your garage door, giving you ceiling space. As always, this model comes fully equipped with Security+ 2.0:registered:, MyQ:registered: Technology, as well as a Timer-to-Close system. Remember, it is strongly advised that all LiftMaster Openers and Operators be purchased through a dealer and professionally installed. Different fob systems with different designs for all your needs. Automatic gates offer an extremely effective, secure and space saving solution restricted areas or both public and private car parks. Different brands for remote controls for garage doors that will make your garage door more secure and safe. What does our opener installation package include? 3. Skilled install of opener according to manufacturer instructions. 4. Mount garage door opener according to product requirements. 5. Install and adjust safety sensors, as well as any monitors or lasers, and outdoor key pads. Garage doors are the biggest piece of moving machinery of a home. It adds convenience and more importantly, SECURITY to your household. Looking for impenetrable protection for your family and belongings? 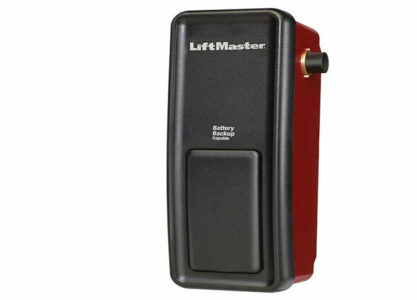 Adore A Door Garage Door Service is pleased to introduce LiftMaster’s Automatic Garage Door Lock. With select new LiftMaster garage door openers, you can now add the LiftMaster Automatic Garage Door Lock to gain the added security that you require. The addition of the Automatic Garage Door Lock renders your LiftMaster garage door opener (and your garage) virtually impossible to break into. The new LiftMaster Automatic Garage Door Lock boasts a deadbolt lock to maximize LiftMaster’s standard security features, ensuring the homeowner’s complete protection. Homeowner’s will hear the deadbolt lock engage each and every time they close the garage door. This offers peace of mind that their house is protected when they are away from home. The LiftMaster Automatic Garage Door Lock operates in complete synchronicity with your LiftMaster garage door opener. With the free MyQ Technology app from LiftMaster, all members of the household can now monitor the happenings of their garage door from everywhere and anywhere. This offers total assurance that the home is always safe. We repair all makes and models quickly and skillfully. 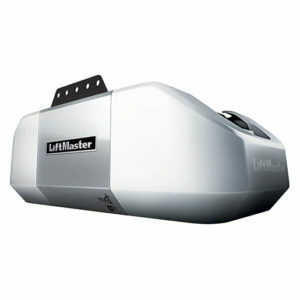 Genie, LiftMaster, Chamberlain & all other garage door openers. We fix them all!